Constructed from iron and glass. 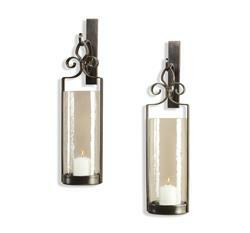 Topped with the classic Fleur de Lis, this set of candle sconces bring a traditional motif into a contemporary setting. Whether modern, rustic, or French country, the Fleur sheds new light on diverse design styles.